Overwhelmed by the state of our overgrown basil pot*, D whipped up some pesto the other night. We were out of pine nuts, but I mentioned that I'd seen recipes where people use walnuts. It worked beautifully. 1. Toss everything except the olive oil and the salt in the food processor and blend until a paste forms. 2. Add olive oil in a slow stream. Taste before adding salt. D sprinkled some chevre on top. Because everything is better with a bit of goat cheese. *Basil really likes to be hacked down regularly. Don't be nervous - trim it all the way down to the last couple of leaves on the stalk. It will pop right back up. easy, fast and fresh. this is definitely my type of meal! yum...this looks incredible. now i just need some overgrown basil! Pesto is my fave. I never get tired of it. Spinach and arugula also make great pestos. oh WOW - that sounds delicious! I've never tried it with walnuts before, but sounds like an awesome dinner! What a brilliant idea! I've never made homemade pesto because I can't bring myself to buy those uber-expensive pine nuts. This sounds like a great version for a cheap-o like me! Yay!! I discovered your blog today, and I fall in love with it!! You are so creative!! I’ll be subscribing to your feed and I hope you write again soon! i've also used almonds in pesto and that works just fine too. cheaper than pine nuts... i admit i am scared to cut back my basil. i guess i should though! I love to make pesto and freeze it in ice-cube trays when the basil bush gets to be too unruly. Mmmmmmm. Perfect timing! 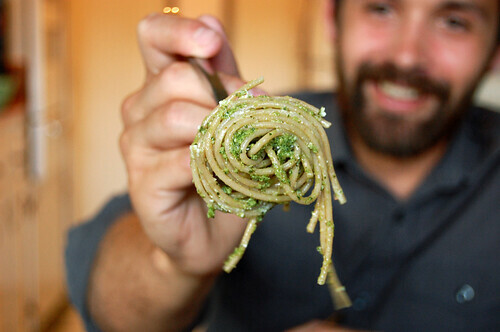 We got a bunch of basil in our farm box this week and i've been planning pesto--i'm going to use this recipe for sure! have also made pesto with hazelnuts, with good results! No, really - you can hack it all the way down, so that there are just nubbins of stem and a couple of leaves. I'll try to get a picture to show you. I swear, it pops right back up so you end up getting more basil in the end. Your pesto looks good! I was surprised to learn that basil plants like to be trimmed so much, this is definitely good to know since I haven't been using my plant very much in fear that it would not grow back. I needed this! 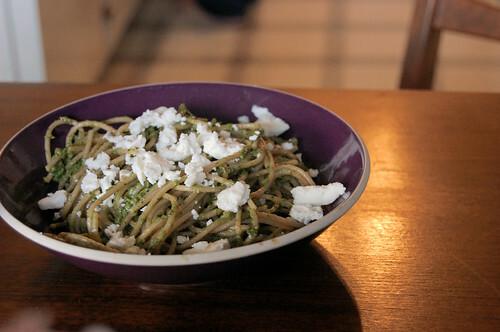 I'm making a goat cheese spread this weekend and it calls for pesto. i'm such a NON-gardener, i've been stressing about what to do with my sad basil. thanks! Hi! After reading about the wonders of basil-trimming, I found this online about how to prune basil and thought you might enjoy it. Totally agree about the goat cheese. Looks gorgeous, as always. We have basil coming out our ears right now and I've frozen some but think I'll be craving something pesto-y this weekend. Thanks for the inspiration! Made this tonight - SOOOOOO good. I was out of pine nuts, and this saved the day!